The wireless video camera can be viewed via the Internet provided that it’s properly configured on the Local Network. To access the video camera on the Internet, you have to go to the camera’s web-based setup page and take of the domain name registered with SoloLink. You can also access the camera using the router’s Internet IP address along with the port assigned to the camera. NOTE: Linksys Internet Video Cameras use ActiveX OCX applet control to view videos using the Internet Explorer browser. NOTE: If you are using Mac® to access the camera's web-based setup page, click here. 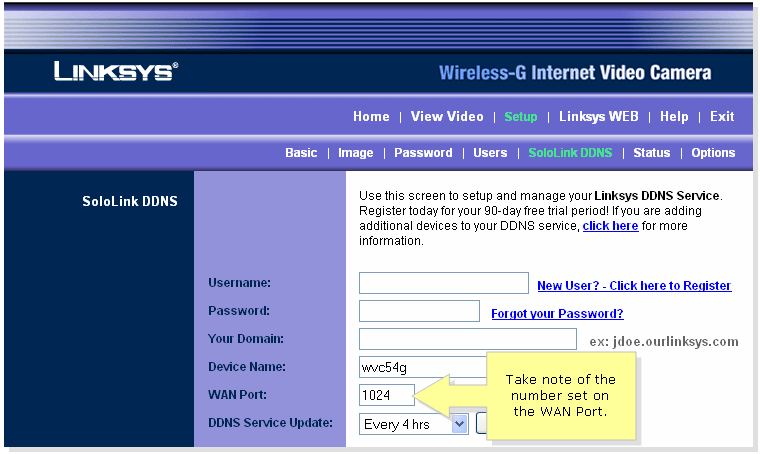 When the Wireless Video Camera’s setup page appears, click Setup then click SoloLink DDNS. On the SoloLink DDNS page, take note of what it says in your domain. This will be the URL that you need to access to view the camera on the Internet. 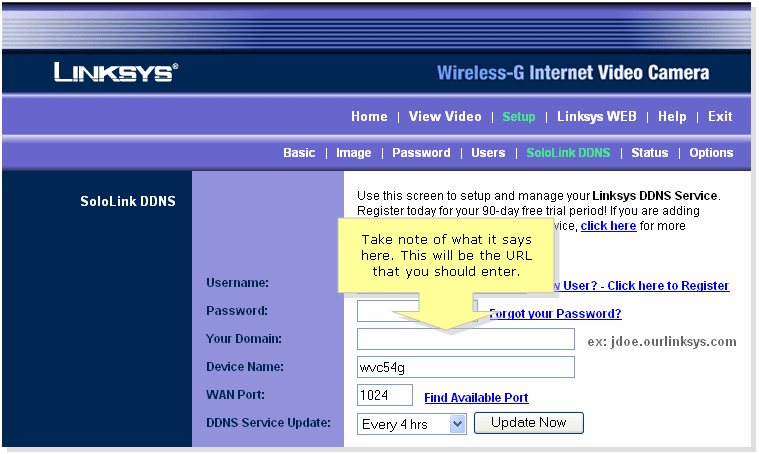 NOTE: It should be in this format: .ourlinksys.com where username is the username registered with the SoloLink service. If this doesn't not work, proceed to the step below. Take note of what it says under Wide Area Network (WAN Port) as this will be added to the router’s Internet or WAN IP Address. The check the router’s Internet IP Address. For instructions, follow the steps below. 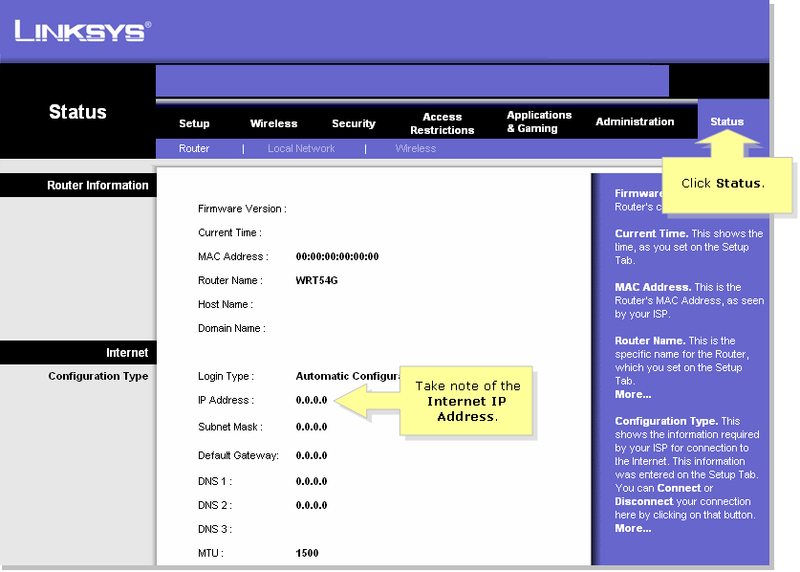 After checking the Internet IP Address of the Linksys router, follow the steps below. Using a computer that’s connected to the Internet from a remote location, launch Internet Explorer and type “http://0.0.0.0:1024” (the 0's represent the router's Internet IP Address and 1024 represents the WAN port you took note of earlier on the Camera’s Web-Based setup page) on the Address field. You should then be able to access the camera from a remote location.